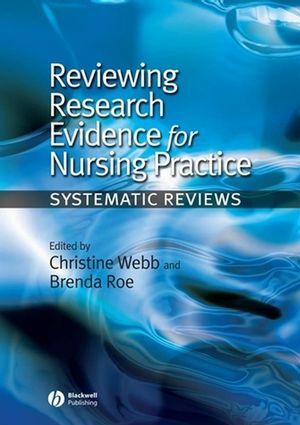 Reviewing research evidence for nursing practice: systematic reviews highlights the key issues involved in conducting different types of systematic reviews - encompassing qualitative studies, quantitative studies and combining quantitative and qualitative studies. It enables nurses and researchers to understand the key principles involved in preparing systematic reviews and to critically appraise the reviews they read and evaluate their usefulness in developing their own practice. Each section starts with an overview of the methodology, followed by a selection of systematic reviews carried out in specialist areas of nursing practice. Part 1 explores systematic reviews and meta-analysis of quantitative research, part 2 explores meta-synthesis and meta-study of qualitative research and part 3 addresses integrative reviews that combine both qualitative and quantitative evidence. The final part explores the use of systematic reviews in service and practice development. Part 1 Systematic Reviews and Meta-Analysis of Quantitative Research. Chapter 1 Overview of methods. Chapter 2 Urinary continence – what the method does – Synopsis of systematic reviews on bladder training and voiding regimens. Chapter 3 Evidence-based practice for nursing and PAMS; also stroke care. Chapter 4 Pelvic floor exercise. Part 2 Metasynthesis and Metastudy of Qualitative Research. Chapter 6 Overview of methods. Chapter 8 HIV and childbirth. Chapter 10 Integrative reviews – enhancing rigour. Part 3 Integrative Reviews of Quantitative and Qualitative Research Chapter 11 Overview of methods. Chapter 12 Toileting programmes for UI. Chapter 13 Domiciliary visiting and public health nursing. Chapter 14 Older people and respite care. Chapter 15 Several possible topics. Part 4 Applications and Uses of Reviews. Chapter 16 Using systematic reviews in service and practice development (to include evaluating evidence, critiquing). Chapter 17 Summary and future directions.